At Clark Dental we take care of your smile. Our dentists, Mark A. O’Hara, DDS and Tyler Clark, DMD provide a range of dental procedures to address the many needs patients have. We treat all ages and have care offerings tailored to enhance oral health and appearance. Whether your toddler requires their first dental cleaning and examination, or you need cosmetic services to enhance the natural aesthetics of your teeth, we have all that you need. Our dentists utilize high-quality materials and the latest in dental treatments and techniques, ensuring your smile is receiving cutting-edge care. We want all our patients to be as relaxed as possible, and grant each patient individual care and attention to do so. Our Eugene dental team makes the atmosphere family-friendly and are always willing to answer questions or concerns. We keep patients informed of their care and help them understand exactly what to expect and the options they have for treatments. Many patients enjoy the look and feel of our office, which features large windows and homey décor. This supplies patients with an open and calm environment and reduces anxiety. We have a dedicated kids area to keep them entertained while parents receiving treatment and headphones in operatories for those who need an extra distraction. We do all that we can to maximize your comfort all while providing quality dental services. Drs. Clark and O'Hara welcome new and returning patients to visit for their next exam and cleaning, or to receive treatments that address teeth pain and cosmetic issues. Reach out to us at 541-344-0413, or visit us on the south side of downtown. 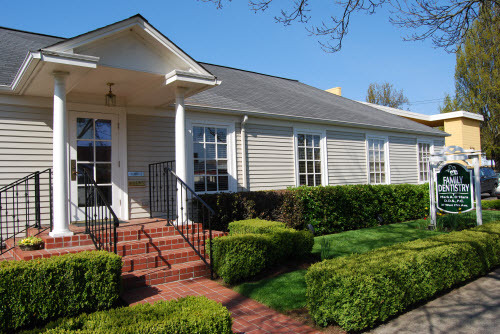 We serve the greater Eugene area, including nearby cities such as South Hills and North Gilham. We are conveniently located downtown with parking available. Schedule an appointment today! Please notify us 24 hours in advance should it be necessary to reschedule. You will be charged $40.00 if you don't keep you scheduled appointment or give us 24 hr. notification.